The most buzzed about product at the 2015 Consumer Electronics Show was by far the new Sony Walkman NW-ZX2. It replaces the Japanese electronics giant’s flagship media player, the ZX1, and will carry a very hefty price tag. The retail price here in the U.S. is in the 1200 dollar range, depending on the retailer of course. Sony spared no expense in the design and hardware of the ZX2 but I can’t wrap my brain around spending that kind of scratch for a portable media player. The OS is Jellybean for heaven’s sake! This is absolutely a niche product. I KNOW there are folks out there already yelling “Shut up, Sony, and take my money” but I am not one of them. Sure, the new Walkman can play all the uncompressed and “better than CD quality” resolutions you can think of but DANG, I just can’t get past the 1200 samolians. If I’m going to enjoy a DSD master of some fantastically performed and engineered piece of music I will do it in the comfort of my home, on my Hi Fi, and NOT on a portable media player that I’ll schlep with me on the subway, a plane, or connect to my car stereo. All far from ideal listening spots. However, I wouldn’t mind listening to my Apple Lossless files and FLAC files on a relatively inexpensive device that I can toss in my bag and that can power a decent pair of full sized headphones. That’s where the FiiO X3 Digital Audio Player comes in. It sells for $199 dollars and plays back all the popular lossless formats at up to 24 bits and 192 KHz sample rates. And yes, it sounds damn good. Every in-ear monitor and headphone played well with the X3 but for some power hungry cans you’ll have to switch the gain controller to high and expect a significant hit to your battery level. The bass response is very good and well controlled with pleasant mids and highs. Chinese electronics manufacturers FiiO has a reputation for producing reasonably priced, high-quality audio devices that even so-called audiophiles find appealing. The X3 audio player is their mid-priced player as the X1 covers the low end and the X5 carries the flag. Files are transferred via micro-USB interface and the X3 features 8GB of built-in memory with the option of adding up to 128 GB of additional storage with a microSD card. The player itself has a fairly sturdy metallic shell and is small and light but I found my self wishing it sported a touch screen. Coming from the click wheel and iOS displays of the iPod, the button layout takes some getting used to. One killer feature I especially like on the FiiO X3 is the asynchronous USB DAC functionality with PCs and Macs. I can leave my portable DAC at home, use the X3 to drive a decent set of headphones and just worry about which ones will pair to up nicely with my laptop that day. Several companies like iRiver subsidiary Astell & Kern and QLS offer alternatives to the FiiO but none can match the pure bang for the buck quality of the FiiO X3. 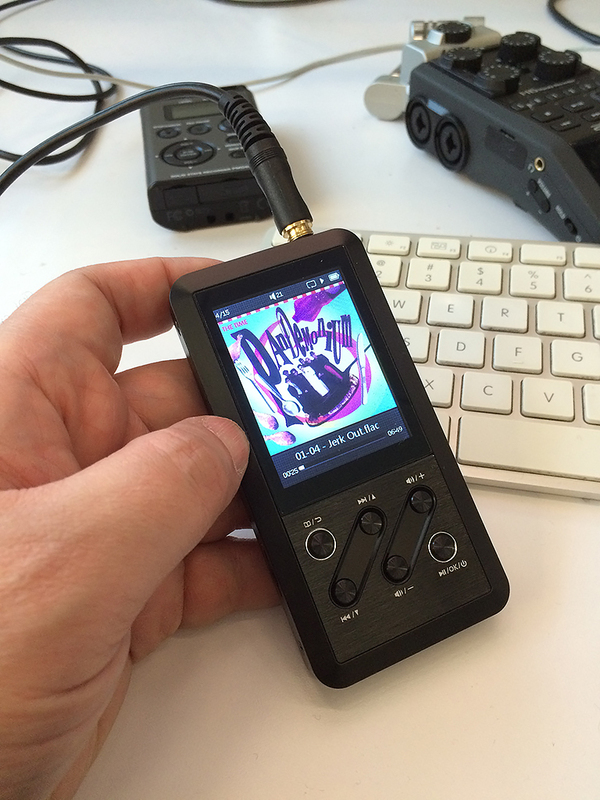 Oh, and before I forget, the FiiO X5 plays the same “better than CD” formats that the SONY NW-ZX2 does. For about $800 dollars less.